Got 150cm long black wig. Not natural black as I would had prefer but still its nice. The fibers are really thin. Like my real hair is many times thicker. Hahah first time dealing with such a length. So gotta do the usual routine. Wash wig! Important to me even for new wigs because I am just paranoid if the wig got dusty and stuff like that from storage. Or worse... Hair lice. Even if its new, its still dangerous. I don't have a basin or pail, so thats why I am doing it in the wash basin. And my wash basin do not have the plug either. Lol. Next, you gotta pour some hot water into the small pail you washed along just now. Warm water is fine too because it will be horrifying if your wig isn't heat resistant. 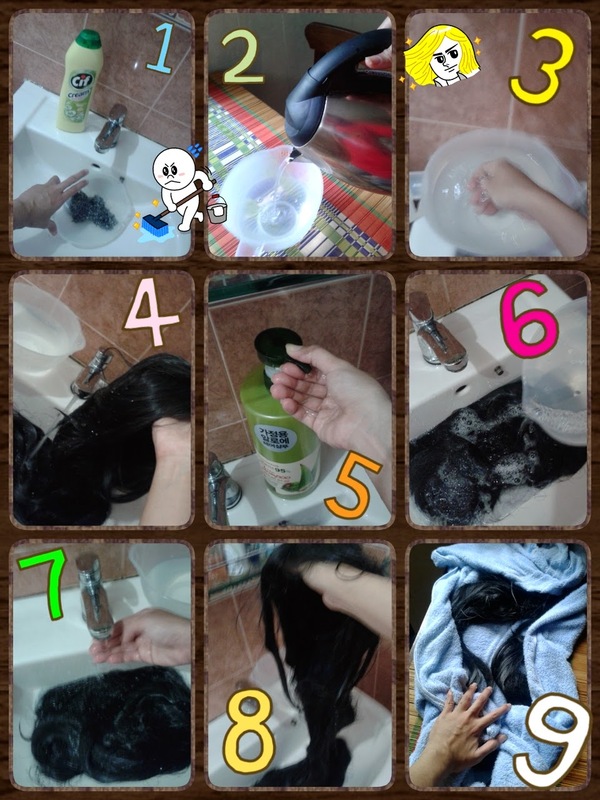 Then mix in hair shampoo into the pail of hot water. Until its all bubbly. I added more shampoo directly on the partly submerged wig. More bubbles! Next you got to pour in the hot water + shampoo. A little at a time while you gently 'shake' the wig in the water. The bottom most got to be receiving the shampoo and hot water too. Don't use all of the hot water yet. After that, run the tap again. 'Shake' the wig submerged in cool water now, until very little bubbles is visible. Then pour in the rest of the hot water and repeat the previous 2 steps. You can also add conditioner at this stage. I don't even condition my real hair, so I don't own a conditioner. When no more bubbles are floating about, rinsed the wig with cool water. Toss is to drain as much water as possible, so it won't be dripping all over the floor later on. The very last step, towel dry! Like real hair, just gently pat the wig. Pat and pat dry to minimise broken strand, damages, and tangle terror. Air dry it completely or use hair dryer if you are impatient. Thats it man. Now you got a clean and nice smelling wig.